Indira Priyadarshini Gandhi (Hindi: इन्दिरा प्रियदर्शिनी गान्धी, pronounced:/ ɪnd̪ɪra ː prɪjəd̪ərʃɪni ː ʰ nd̪ ː ga i ː/) (born in Allahabad, UP, India, 19 November 1917 – 31 October 1984 at the age of 66 years) was the Prime Minister of India in the period January 19, 1966 – March 24, 1977 and continues on January 14, 1980 until he experienced the assassination on October 31, 1984. As the daughter of India's first Prime Minister Jawaharlal Nehru and mother of Rajiv Gandhi, Indira Gandhi is a woman whose tumultuous and highly controversial as leader of the political party and the politics of his country. On January 19, 1966, he was elected Chairman of the Congress Party, Lal Bahadur Shastri succeeded. 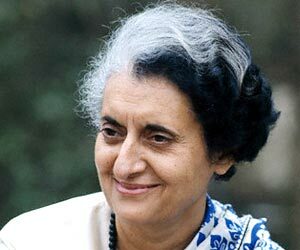 Indira was later killed in a shooting action in 1984. Born as Indira Nehru, he married Feroze Gandhi, who had changed his name from "Feroze Khan" and have no connection with the famous figures of the independence of India, Mahatma Gandhi. She was the first woman to become Prime Minister of India. He was killed in 1984 in action the terror conducted two guards who embrace the teachings of Sikhism. The action that is triggered by the instructions that told the army attacked the Golden Temple in Punjab. The temple was made the headquarters of Sikh followers who want Punjab as their country. 1942: Indira Gandhi married Feroze Gandhi. 1944: Rajiv Gandhi was born. 1946: Birth of Sanjay Gandhi. 1966: Indira Gandhi is elected as Prime Minister of India. 1980: Indira Gandhi re-elected as Prime Minister. 1980: Sanjay dies in plane crash. 1984: Indira Gandhi is assassinated.